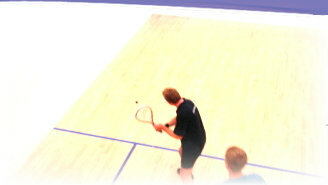 Our Racketball Club Night is held every Thursday from 7.40p.m to 9 p.m (except Bank Holidays). Equipment is provided, you just have to turn up wearing sports kit and a pair of clean, non-marking trainers. The format of the evening depends on numbers, but, you will be able to have as much or as little "on court " time as you like. Club night is an informal affair, if you are a member of the squash club you pay only £2.50 to play, if you are not a member you pay £3. For membership benefits see How to Join . Regular participants are encouraged to join the squash club to take full advantage of the sporting and social benefits on offer.